Brooklyn has a reputation for being the source of quality house music that can be heard around the globe. Samuel Walker and Gavin Royce, who joined together to form Walker & Royce in 2011, are the epitome of how the Brooklyn sound has soared in the global house music scene. Having known each other for a bit in NYC’s large – but underground music scene, Walker and Royce captured the attention of house music enthusiasts with their 2012 EP “You’re Not Welcome”, released on Damian Lazurus’ label Crosstown Rebels. Since then, they’ve been catapulted in to the genre’s spotlight. Their tracks bridge that vintage Chicago feel, with a deep, precise, glitch- synth Detroit-esque style, to create a sound that’s truly unique, modern, and all their own. 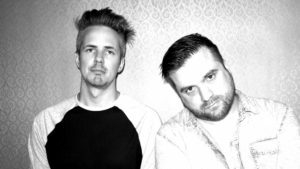 Their versatility shows on their 2016 EP “Boy”; their first EP on Claude Vonstroke’s renowned Dirtybird Label. The title track boasts the funkiest of basslines, but has a trace amount of that darker, grind your teeth, Tech-House to satisfy the inner Goth kid in us all. Not to short change the other track off the EP – “I.T.B.”, which can be heard at regularly at festival stages around the world. But let’s not get the facts twisted up, or the message lost in translation: when Walker & Royce hit the decks – anyone within the radius will groove, bounce, and move their feet. Their sound – while familiar and clearly influenced by their contemporaries – has this gritty, deep, New York City feel to it. Walker & Royce are a key example – proving that the House Music as a whole is exploding with fresh talent. These hard hitters from Brooklyn are most definitely leaving their stamp on the scene, and we can’t wait to have them lighting up New York City harbor with us. 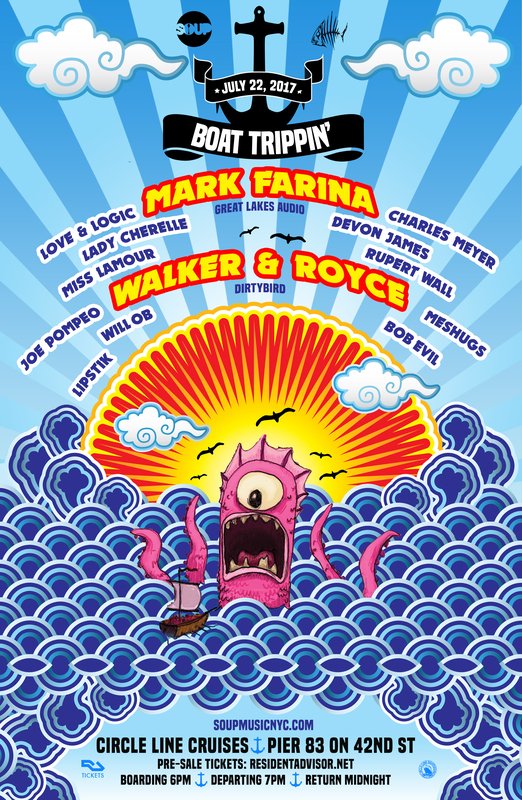 Join us on Saturday July 22nd for our BOAT TRIPPIN’ party with Mark Farina and Walker and Royce, presented by SOUP and RVDIOVCTIVE. Check out their SoundCloud to prep for the big party! When we think of mushrooms, we might think of magic. Add some jazz, and there you have Mark Farina’s magical Mushroom Jazz, a series of music compilations that have spanned a successful history for over 20 years. With origins that started in 1992 in the format of the mix tape and a DJ residency in San Francisco, Farina artistically combines musical elements of downtempo, hip-hop, jazz, R&B, French, and Latin mystically mixed together to form an unmatched musical experience. The series has become a staple of San Francisco record label Om Records with 7 volumes released over the the years. Not only has Farina become an iconic figure in the electronic music scene with his eclectic and groovalicious Mushroom Jazz, but he is also well-known for his deep Chicago house mixed San Fran style. When you hear him, it can be expected that you will experience a musical journey. His unique style and infectious beats have enthralled music lovers world-wide for over two decades. 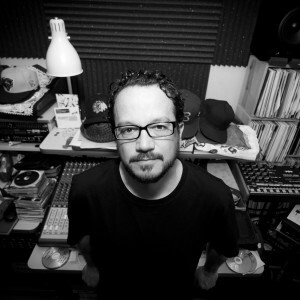 Make sure to check out Mark Farina on December 23rd at Verboten joined by SOUP’s own Love & Logic. It will definitely be a night to remember! And it’s FREE until midnight with a donation of a new toy. Check out the event on Facebook. Find out more about Mark Farina on Resident Advisor. 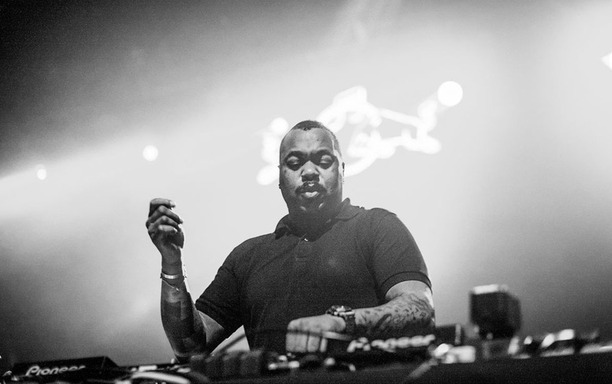 If you know anything about house music, then you must be familiar with one of the most prolific members of this scene: Derrick Carter. On December 11th, SOUP will host this legendary artist at their 3 year anniversary party for their residency at one of New York City’s top dance clubs, the world-renowned Cielo. Derrick Carter is a true legend of the underground; not only are his performances impeccable, but he also brings a special energy to the dance floor like no one else. California-born and Chicago raised, Derrick became a major player in the electronic music scene in the late 1980’s. His first solo release was “Love Me Right” in 1987, followed by another release with his EP release alongside fellow artists Mark Farina and Chris Nazuka as the group Symbols & Instruments. Although the album did not receive commercial success, it helped launch Derrick as an international star. In the following years, he ran the famous record label Classic Recordings and he is well-known as remixer for a diverse range of artists. More importantly, he is legendary for his unique Chicago-house sound that fluidly melds old school disco, soul and jazz delivered deliciously in the form of house music. He has managed to remain a major player in the underground scene over the last 25 years and shows no signs of stopping. Make sure to check out Derrick Carter in December at Cielo with support from SOUP’s Love & Logic, Bumpy Nuggets and Dylan Holgan, and Chris Bishop. It’s guaranteed to be a fun night of dancing and music. Find out more about the event here.